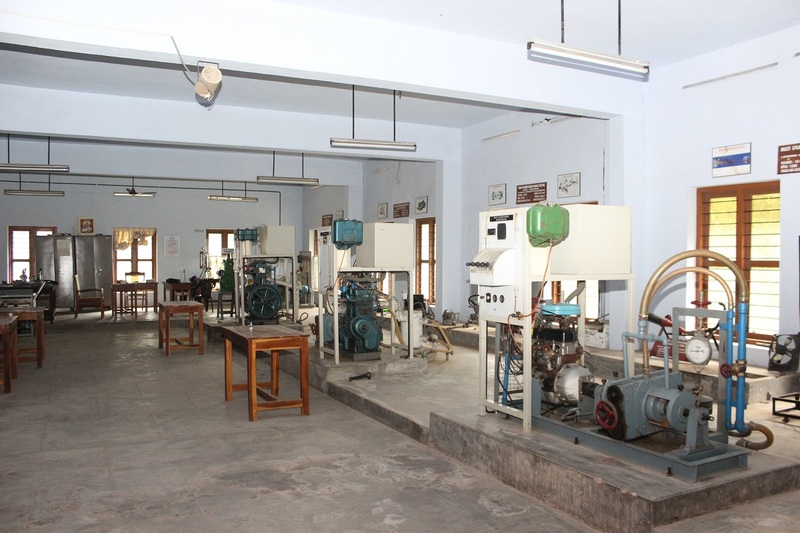 The Department of Mechanical Engineering (ME) is one of the largest departments in the college, which was started in the year 2004 with a sanctioned intake of 60 students. Later on the intake was increased to 120 from 2012 onwards. The department started a postgraduate program in Computer Integrated Manufacturing (CIM) in the academic year 2011-12 with a sanctioned intake of 18 students. The department is also an approved research centre of APJ Abdul Kalam Technological University (KTU) for the Ph.D. program. The department houses eight instructional laboratories, two project laboratories and a research laboratory. Additional facilities such as Coordinate Measuring Machine, Rapid Prototyping Machine, CNC milling machine and CNC lathe are provided in the department to improve the quality of learning experience. 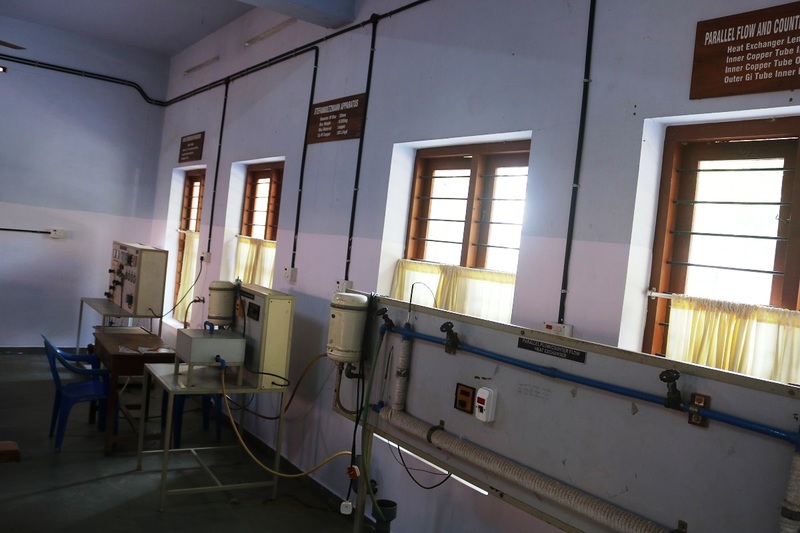 The department is well equipped with computational facilities and is having a computer integrated manufacturing centre. The undergraduate program in Mechanical Engineering aims to prepare globally recognized manpower enabling the graduates to seek higher studies and take up leading positions in academia and industry, both in India and abroad. With more than 480 students on roll in the undergraduate level, the department is committed to the all-round development of its students. The department has 28 faculty members specialized in major fields of engineering and technology. In addition to teaching undergraduate and graduate students, the faculty actively pursues research in various fields of Mechanical Engineering. To groom professionally competent Mechanical Engineers with social commitment. Create an environment that encourages students to become competent Mechanical Engineers. Promote lifelong learning, entrepreneurship and research. Inculcate human values and leadership qualities for holistic development of students. Identify, formulate, review research literature, and analyze complex Mechanical Engineering problems reaching substantiated conclusions using first principles of mathematics, natural sciences, and engineering sciences. Design solutions for complex Mechanical Engineering problems and design system components or processes that meet the specified needs with appropriate consideration for the public health and safety, and the cultural, societal, and environmental considerations. Use research based knowledge and research methods including design of experiments, analysis and interpretation of data, and synthesis of the information to provide valid conclusions, related to Mechanical Engineering. Create, select, and apply appropriate techniques, resources, and modern engineering and IT tools including prediction, modeling and analysis to complex Mechanical Engineering activities with an understanding of the limitations. PSO1.Apply principles of engineering, basic science, and mathematics to model, analyze and design mechanical systems, components and processes. PSO2.Have proficiency in materials and manufacturing processes to design, analyze and develop products that meet specific requirements. 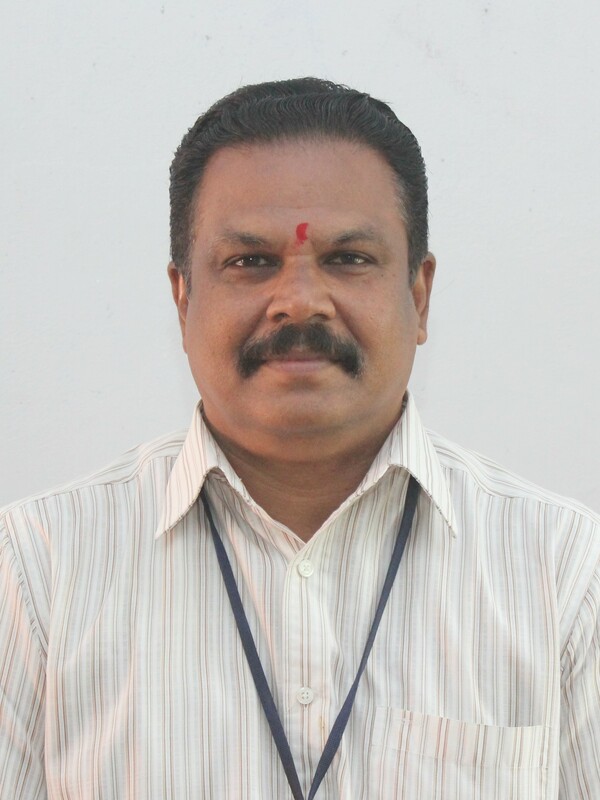 Dr. Saji Varghese completed his Bachelor’s degree in Mechanical Engineering from TKM College of Engineering, University of Kerala with honours and second rank in 1978. He took his Master’s degree in Production Engineering from IIT, Bombay and Ph.D from IIT, Madras in Mechanical Engineering. 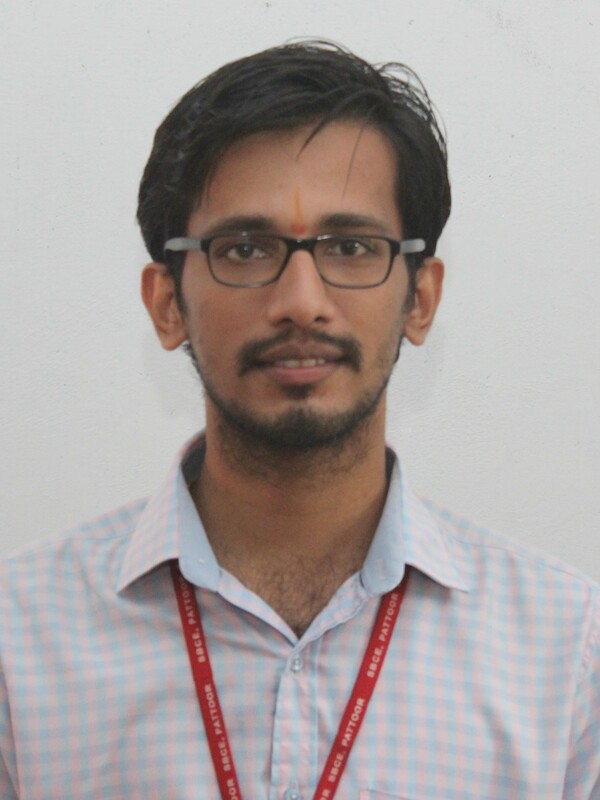 He has a patent in sensors for in-process monitoring applications and also published more than 20 papers in different journals and conferences. 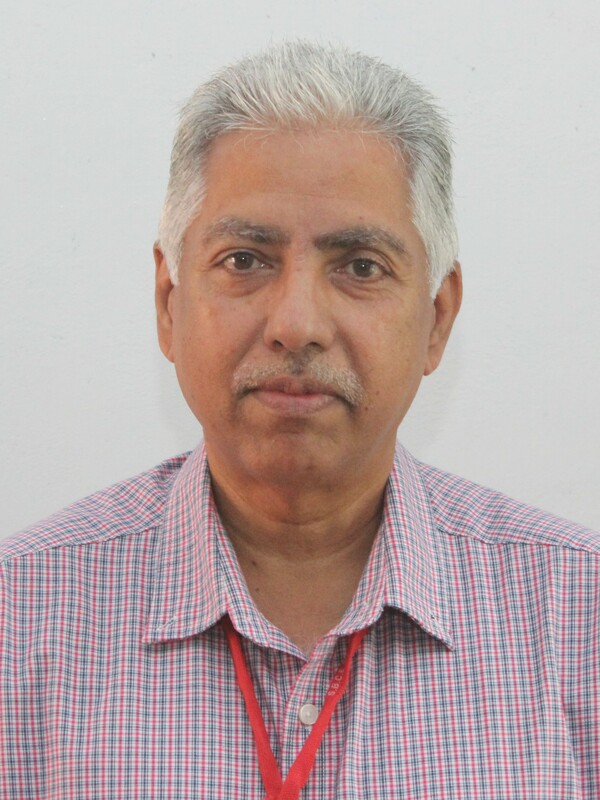 He has over 35 years of teaching experience in India and abroad. After working in the Department of Mechanical Engineering, TKM College of Engineering, he joined the Yanbu Industrial College (YIC), Royal Commission, Yanbu, Kingdom of Saudi Arabia as a faculty. There, he was a team member and leader in ABET accreditation process for two cycles for various programmes at different levels and served in many committees including curriculum development, Quality Assurance and Planning. 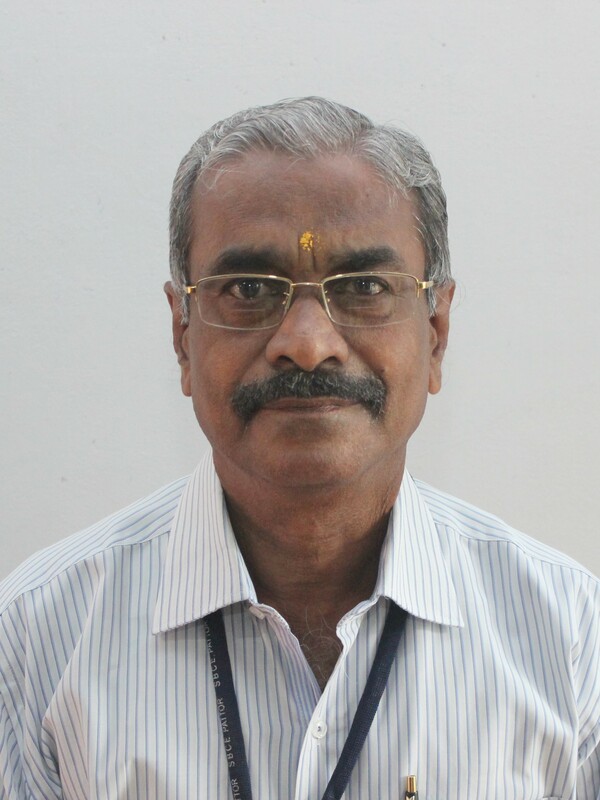 Dr. Saji is a life member of ISTE and Institution of Engineers. His areas of interest are manufacturing, quality control and sensors. INDUSTRIAL REFRIGERATION AND CRYOGENIC ENGINEERING. 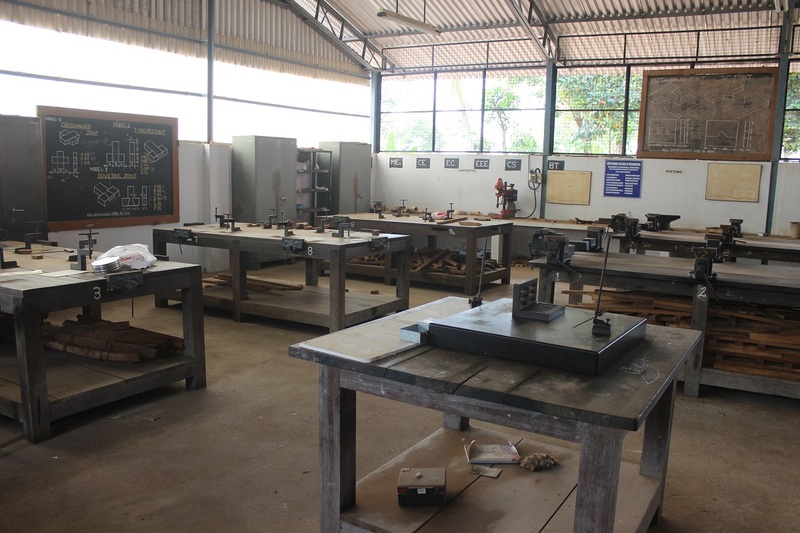 Basic mechanical engineering workshop is intended to make the students aware of the basic mechanical engineering operations and familiarize them with different tools used for various mechanical engineering operations. Practices of engineering work like fitting, carpentry, foundry, forging, welding, sheet metal work, assembly are provided here. Carpentry: Study of tools and joints. Practice in planning, chiseling, marking and sawing. Joints – Cross joint, T joint, Dove tail joint. Fitting: Study of tools, Practice in filing, cutting, drilling and tapping. Male and female joints, Stepped joints. Sheet Metal Work: Study of tools. Selection of different gauge GI sheets for jobs. Practice on riveted joints. Preparing tube joints, frustums, trays and containers. Plumbing: Study of tools. Details of plumbing work in domestic and industrial applications. Study of pipe joints, cutting, threading and laying of pipes with different fittings using PVC pipes. Use of special tools in plumbing work. Foundry: Study of tools. 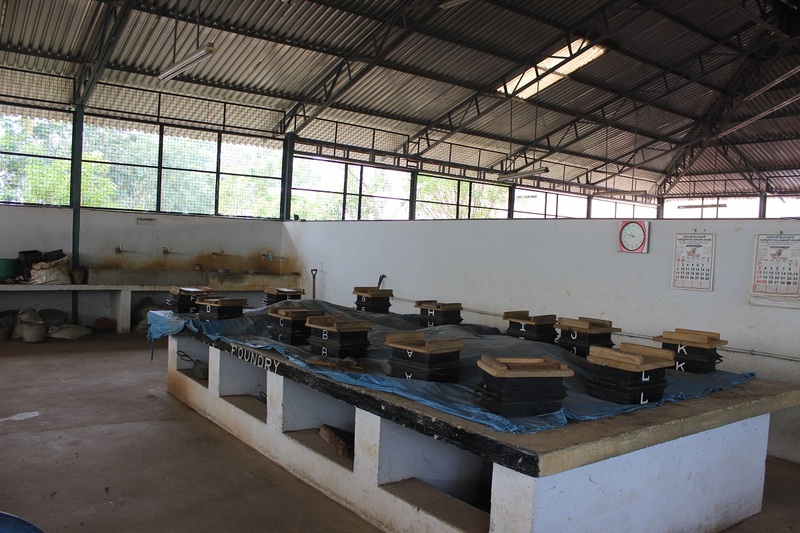 Preparation of sand, moulding practice and demonstration of casting. Welding: Study of welding machines. Straight line practices, Making of But joint, T joint and Lap joint. Smithy: Study of tools. Demonstration on forging of square prism, hexagonal bolt, T bolt and Eye bolt. 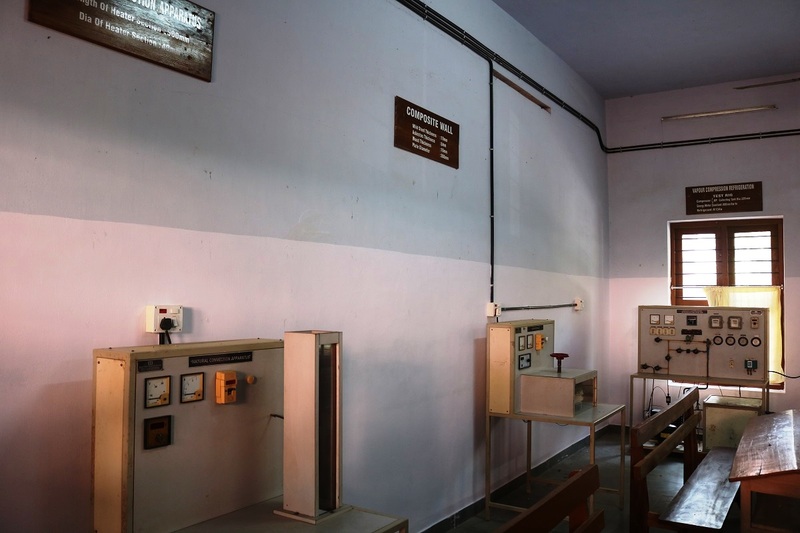 The Fluid Mechanics and Machines Laboratory is equipped with the commonly used turbines in power generation like Pelton Wheel, Francis Turbine and different types of flows through channels and pipes are in the experiment setup with periodically calibrated gauges. Determination of Coefficient of discharge and calibration of Notches, Orifice meter, Nozzle and Venturimeter. 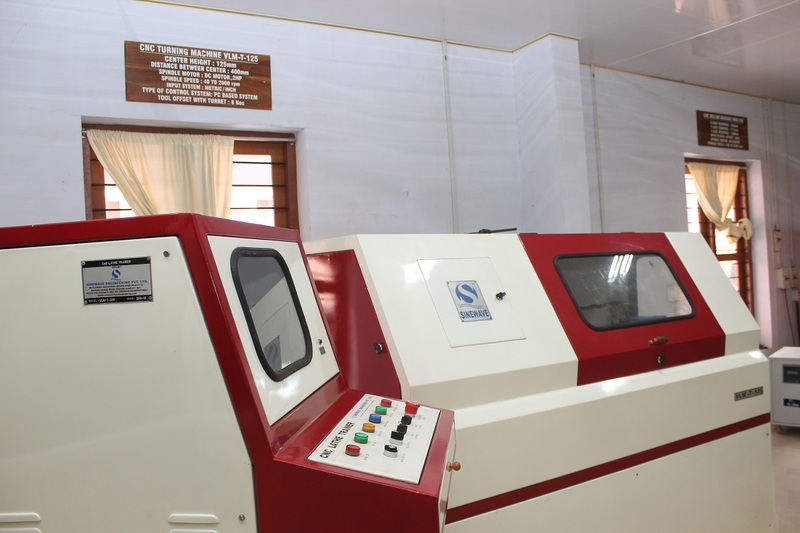 This is equipped with centre lathes, shaping machines, slotting machines, milling machines, radial drilling machine, tool and cutter grinding machine. This lab helps students to study and practice the basic machining operations in the special purpose machines and acquire its applicability in the real time components manufacturing industries. And help us to Study and preparation of program, simulation and exercise on CNC lathe:-turning, step turning, taper turning, thread cutting, ball and cup turning etc. 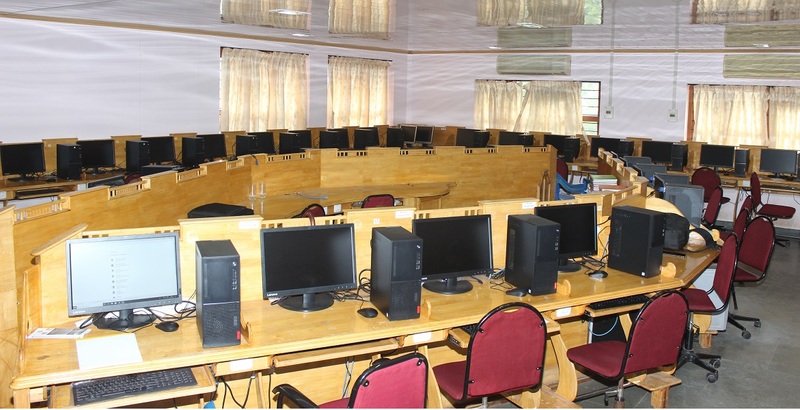 CAD Lab has equipped with more than 85 Computer Systems with high end latest Configuration hardware. The software available include AutoCAD 2015, SolidWorks 2012, Pro/Engineer wildfire 3.0, SolidEdge, ANSYS 15, LS-DYNA, Materials Studio, MATLAB & Simulink, E Yantra (Design Software), I-DEAS, and CATIA V5R10 etc,. 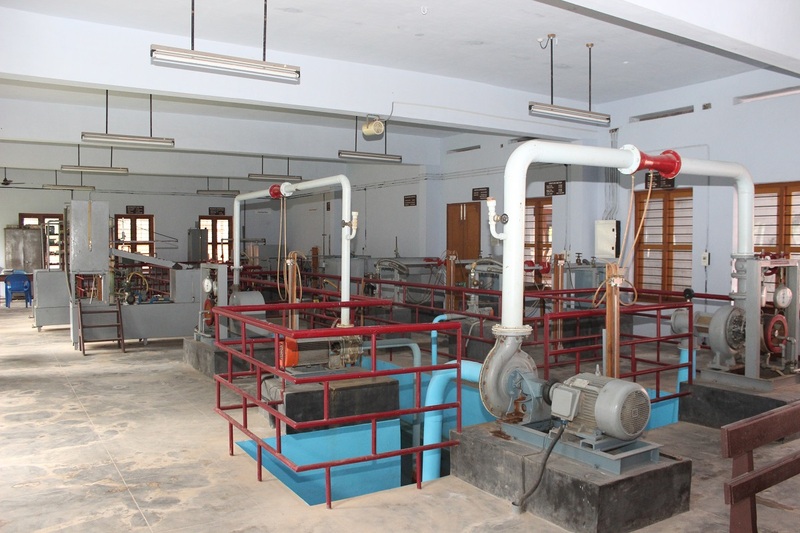 The machines and equipment used to determine experimental data include cut models of 4-stroke diesel engine, 2-stroke petrol engine, 4-stroke and two stroke petrol engines with required specifications, Multi cylinder SI engine, Single cylinder Diesel engine for performance and speed test which is suitable to tests on variable compression ratios. 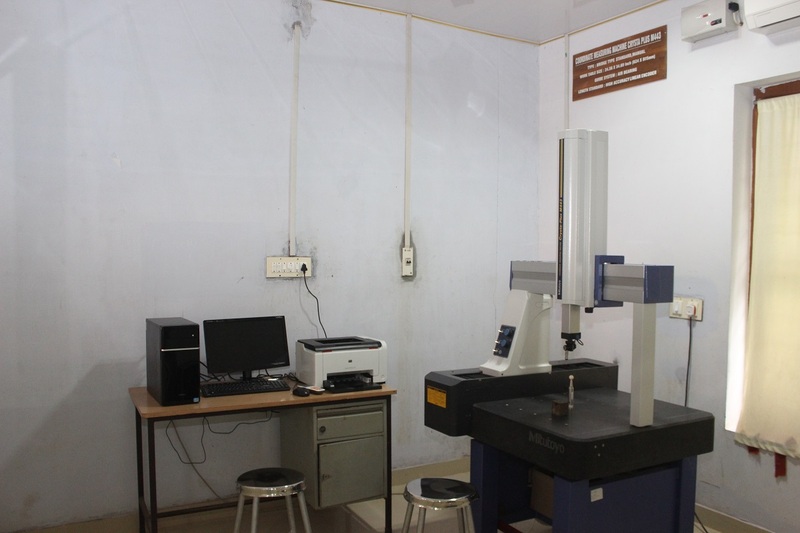 CIM laboratory is equipped with CNC production Lathe, CNC trainer Lathe, CNC Milling machine, Coordinate Measuring Machine, Vision Measuring Machine, Surface roughness tester and CADEM Software. CNC part programming using CAM packages. Simulation of Turning, Drilling, Milling operations. Typical simulations to be carried out using simulation packages like Master- CAM, or any equivalent software. 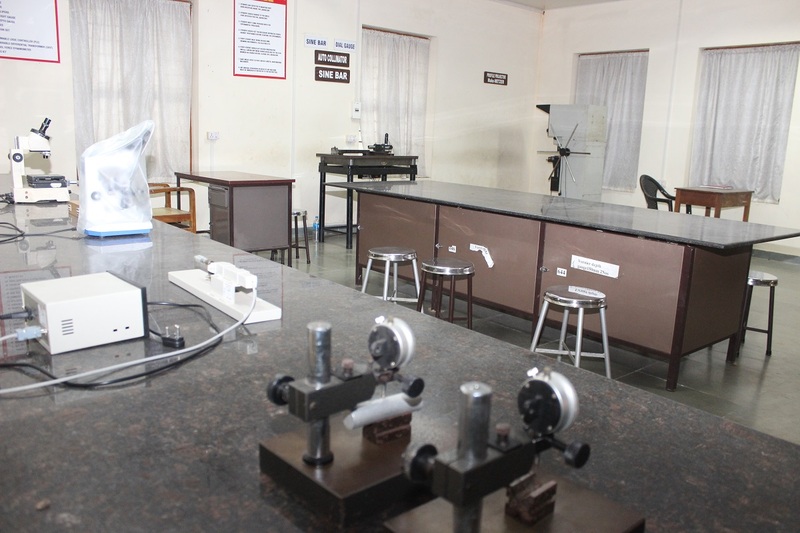 The equipments are used to conduct the various heat transfer experiments, to practice calibration of thermometer and pressure gauges and to do experiments on dynamics. 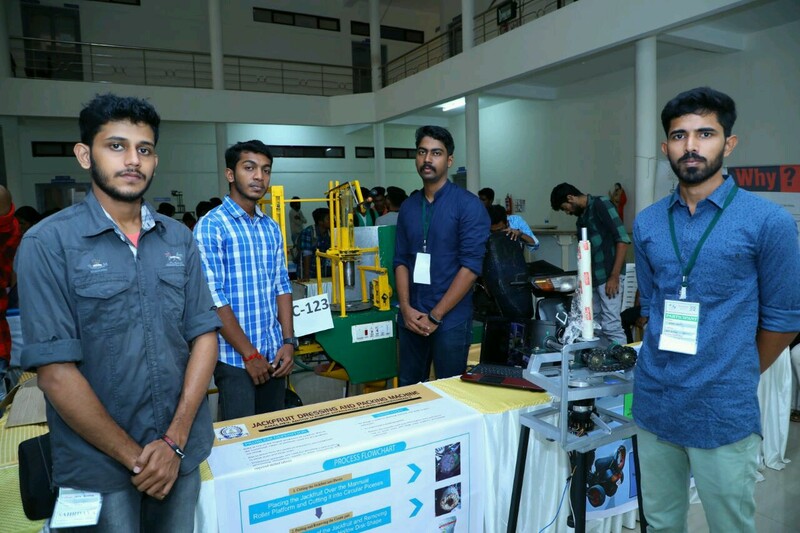 The Semi-Automatic Jack Fruit Dressing and Packing Machine developed by a group of final year Mechanical Engineering students of the college, Mr. Dhananjay Rajesh, Mr. Anoop U Kurup, Mr. Amal Dev and Mr. Harikrishnan S received overwhelming applause and recognition from the Govt. of Kerala. As a token of appreciation, a memento was handed over to Prof. Anilkumar A V, Head of Department of Mechanical Engineering & the mentor of the project, Mr. Vaisakh P S by Prof. C Raveendranath, Honble Minister for Education, Govt. of Kerala in the presence of Adv. V S Sunilkumar, Minister for Agriculture, Govt. of Kerala during the “Jack Fest 2018” organized by the State Horticulture Mission on 24th May 2018 at Thrissur. 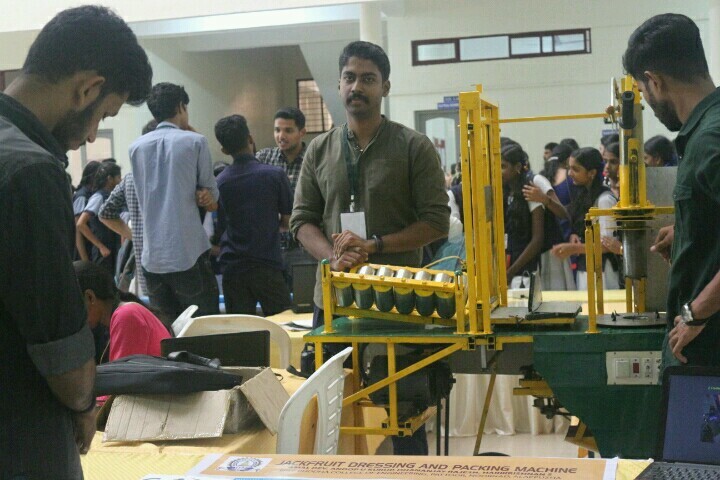 The “Semi-automatic Jackfruit Dressing and Packing Machine” was exhibited in TEKON 2018, a technical fest jointly organized by APJ Abdul Kalam Technological University (KTU) and Kerala State Council for Science, Technology and Environment (KSCSTE) and selected as one among the best innovative project. The event was inaugurated by Shri. Justice P. Sathasivam, Hon’ble Governor of Kerala. 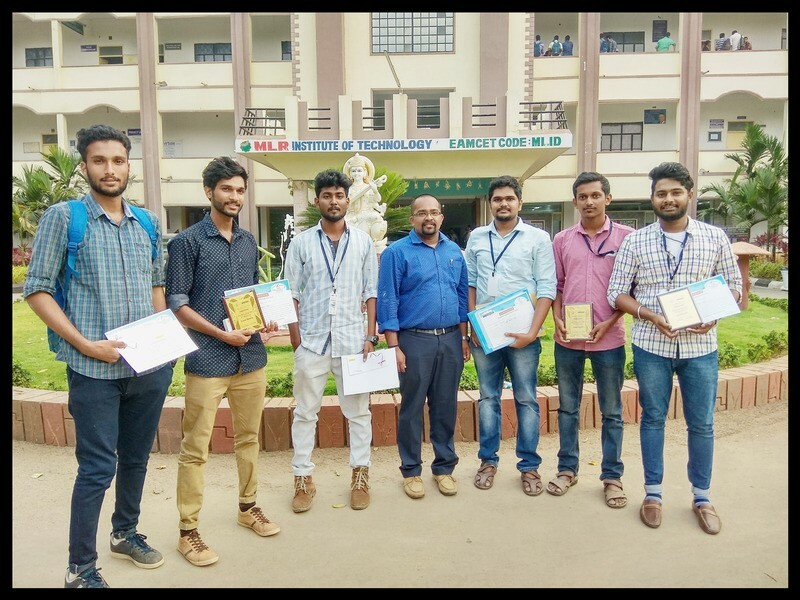 The projects were evaluated by the officials from KSCSTE as well as experts from reputed companies such as TATA, TCS, VINVIH, IEEE, and NEST. The valedictory function of this event was inaugurated by Shri. Pinarayi Vijayan, Honble Chief Minister of Kerala. 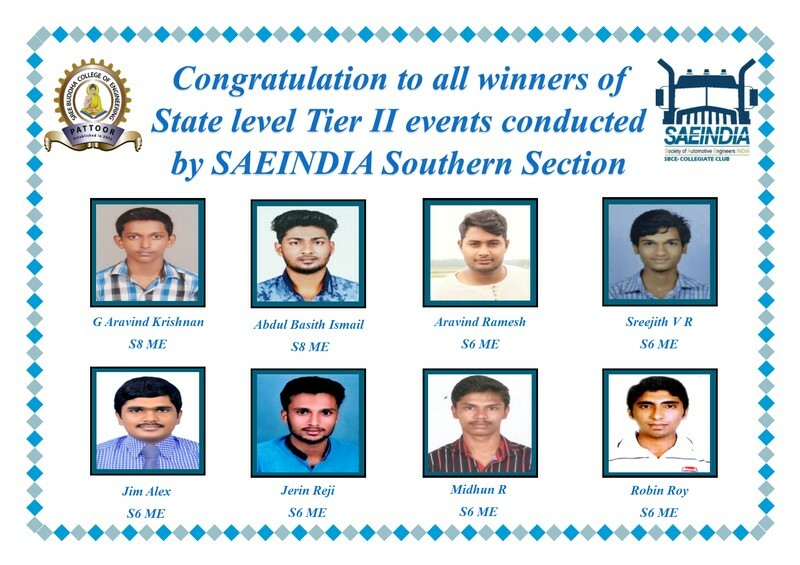 Eight SAEINDIA student members secured prizes for the southern section Tier –II competitions held at Saintgits College of Engineering and among them six got prizes for the National Level Tier –III competitions held at MLR Institute of Technology, Hyderabad. 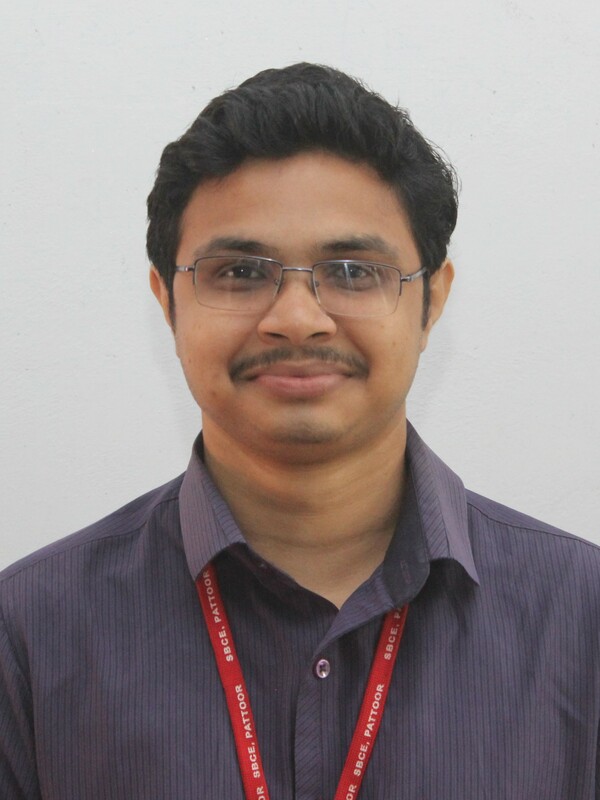 Dr. Trijo Tharayil bagged the award for the best technical paper in the National Conference on “Recent Advances in Mechanical Engineering” RAME2018 held at Sree Buddha College of Engineering, Alappuzha, Kerala, 17-18th April 2018. 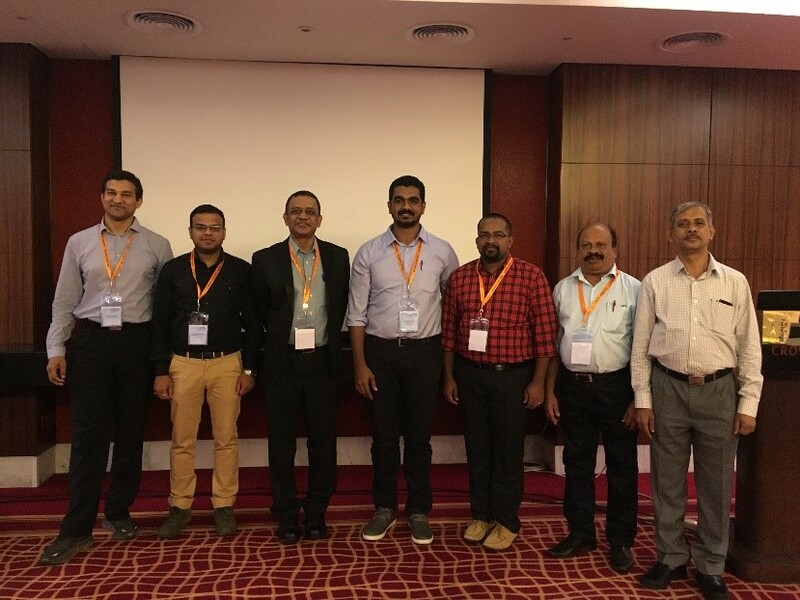 Dr. Sreejith Mohan, Associate Professor, participated and acted as an invited speaker in the 4th Global Nano Technology Congress and Expo (GNCE) held at Dubai during 16-18 April 2018. 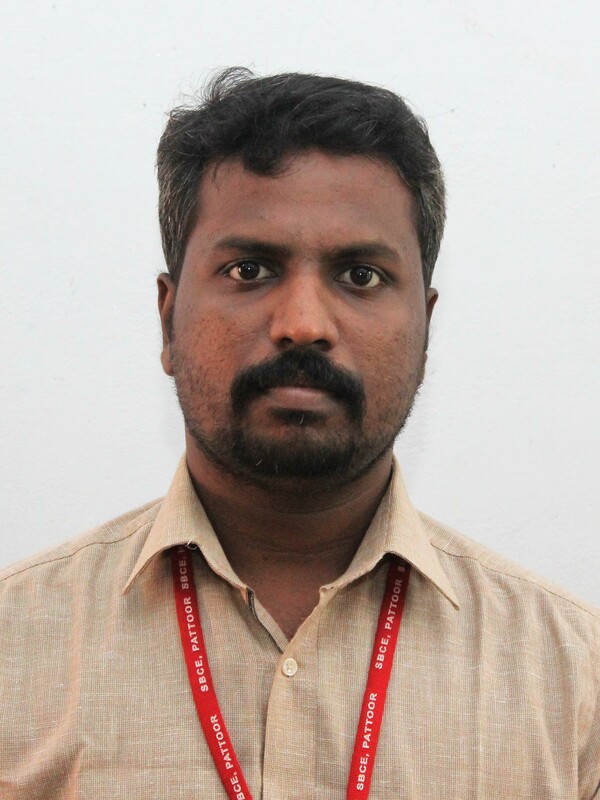 Dr. Sreejith Mohan, Associate Professor, received a fund of Rs. 3,00,000/- for his R & D Project titled “ Design and Development of low fume welding electrodes” from the Kerala state Council for Science, Technology and Environment (KSCSTE). 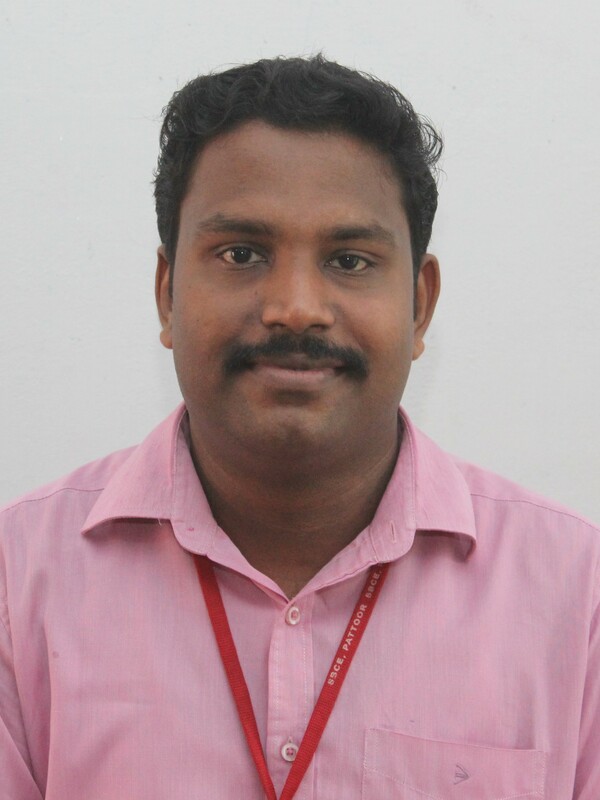 Vaisakh P S, Assistant Professor, received a fund of Rs 10000/- from Kerala State Council for Science Technology and Environment (KSCSTE) for the project entitled “Jack fruit Dressing and Packing Machine” during 2018. 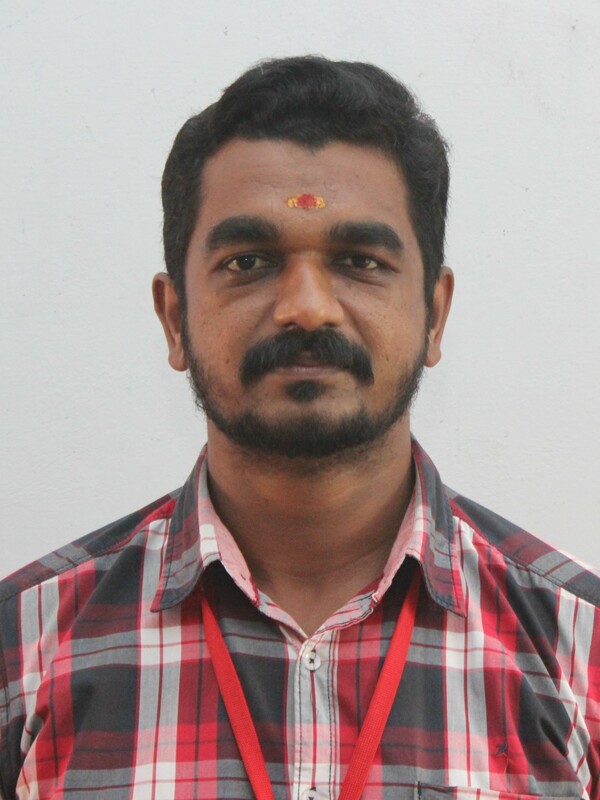 Vaisakh P S, Assistant Professor, received a fund of Rs 11000/- from Kerala State Council for Science Technology and Environment (KSCSTE) for the project entitled “Semi-Automatic Jack fruit Dressing Machine” during 2017. The department hosted a one week Faculty Development Program (FDP) on “Advanced Energy Engineering and Technology” during 2-6 July 2018 wherein around 30 faculties from various engineering colleges in and around the state have participated. The FDP was based on the theme of advancements in energy engineering and technology and have covered most of the thrust areas in the field of energy engineering such as Energy Audit, Environmental engineering, Solar energy conversion, Advances in new renewable energy sources, Biomass generation, Carbon Nano Tubes for energy conservation and energy storage applications. The resource persons were drawn from reputed institutes like IISC Bangalore, NIT Calicut, ANERT and Athul Engineering Systems and Energy Consultants. Besides, there was a one day visit to Rajiv Gandhi Combined Cycle power plant, NTPC Kayamkulam. The department organized a one week National Workshop on “Design of Experiments and Optimization Techniques” during 14-18 May 2018. The objective of the workshop was to enrich the participants with the knowledge on the use of Design of Experiments as a useful research tool as well as to introduce them to various optimization techniques like Nature Inspired Algorithms, Calculus of Variance, Teaching Learning Based Optimization (TLBO) Algorithm etc. The content of the workshop was framed to suit audience from any discipline of engineering. The workshop started with an inaugural function in the morning on 14th May 2018. 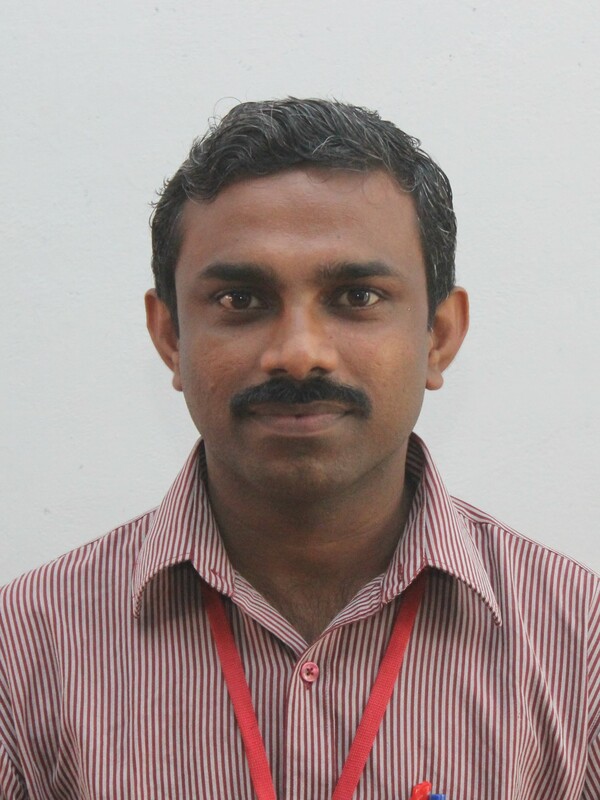 The workshop was inaugurated by Dr. D. Bijulal, Associate Professor, College of Engineering, Trivandrum. The resource persons of various sessions were Dr. S. P. Sivapirakasam (NIT Trichy), Dr. K. R. Balasubramanian (NIT Trichy), Dr. K. Sunil Kumar (College of Engineering, Adoor) and Dr. K Sunil Kumar (College of Engineering Adoor). The number of registered participants was 81 which includes faculty members, research scholars, PG and UG students from various departments and institutes across India. There was a Hands on training session on Design Expert on the last day. The department organized a one day workshop on “Innovation and Project Development” for the first year B.Tech students on 7th February 2018 in collaboration with the Innovation and Entrepreneurship Development Cell (IEDC) of the institute. 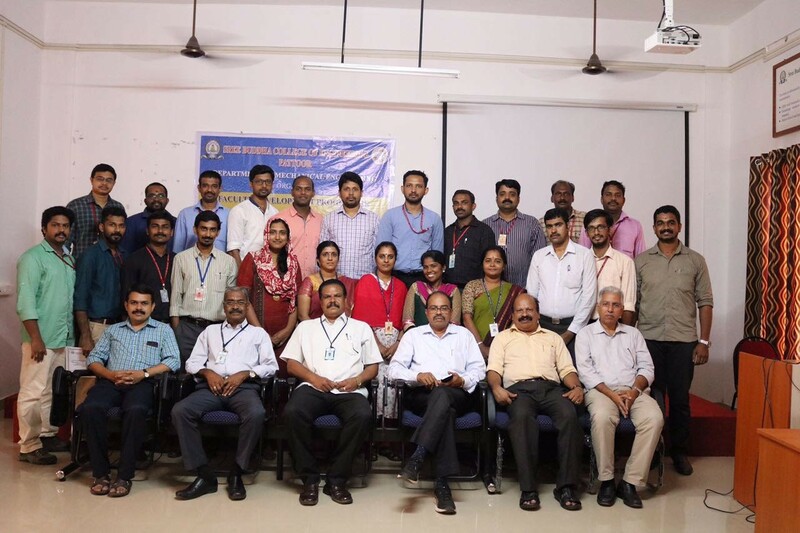 The workshop was coordinated by Dr. Sreejith Mohan and Dr. Trijo Tharayil. 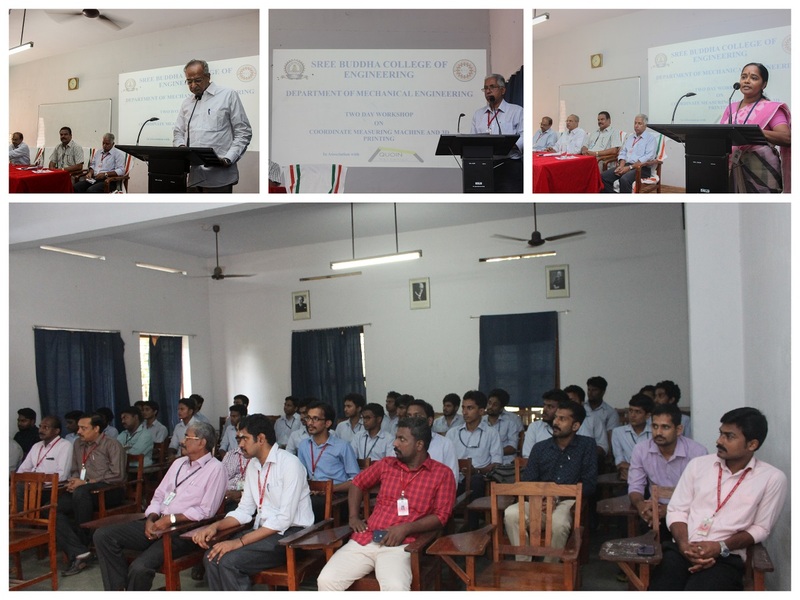 Prof. Anil Kumar A V, Head of the Department of Mechanical Engineering welcomed the gathering. The workshop was inaugurated by Prof. K.K. 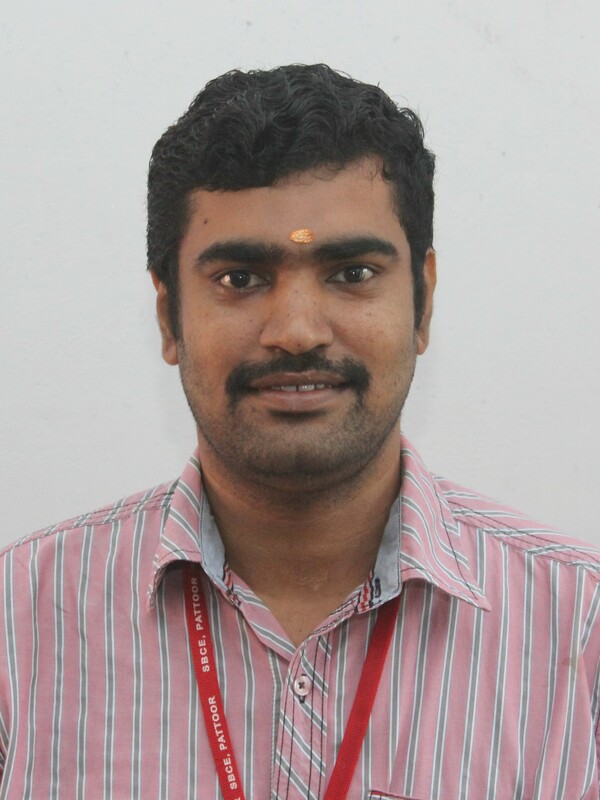 Sivadasan, Treasurer, Sree Buddha College of Engineering. 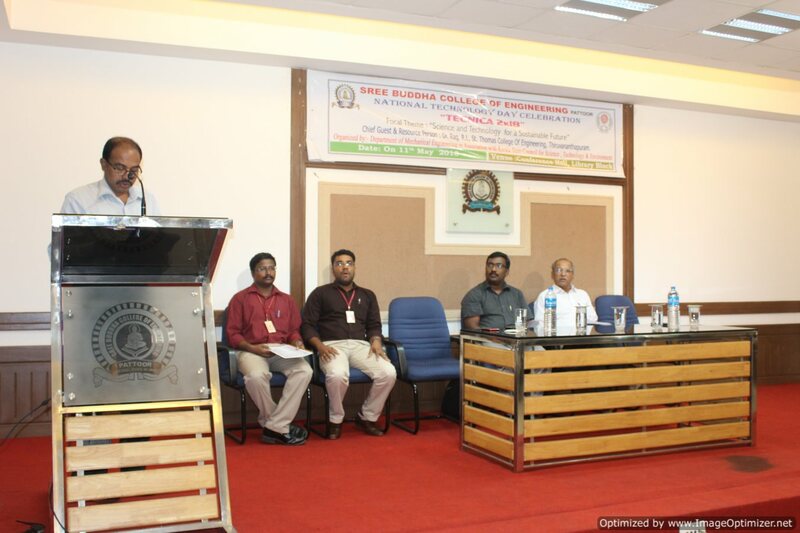 Dr. S. Suresh Babu, Principal, Sree Buddha College of Engineering delivered the presidential address. 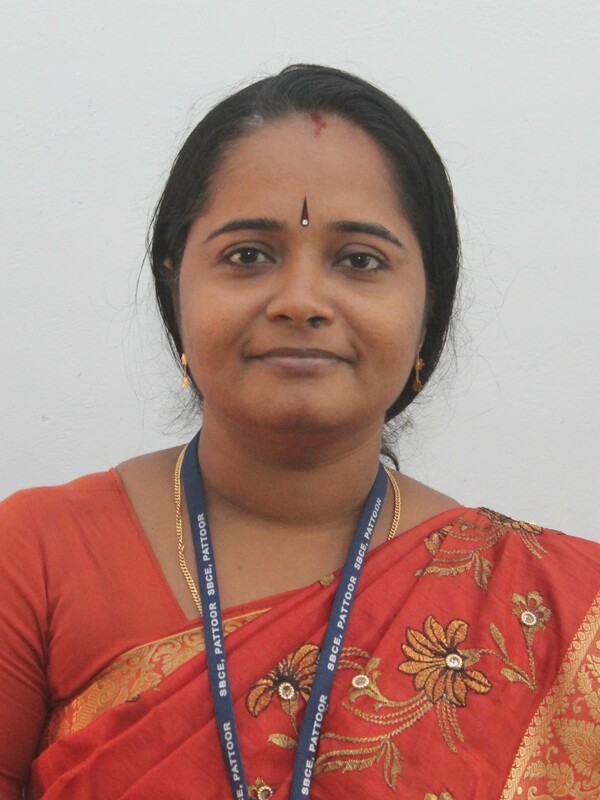 Prof. Sherin Thampi, Asst. Professor, Amal Jyothi College of Engineering delivered the felicitation and Mr. Akash Ashok, student coordinator delivered the vote of thanks. 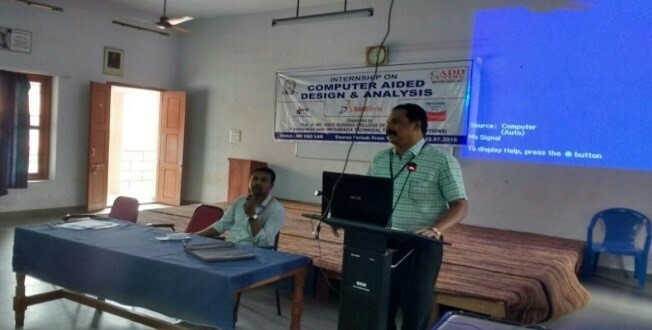 The sessions of the workshop were handled by Prof. Sherin Sam Jose, Head, Department of Automobile Engineering, Amal Jyothi College of Engineering, Kanjirappally, Kottayam. He covered all the major aspects of innovation including its purpose and the role of students in realizing it. He also focused on the requirement, pathway and benefits of undertaking an innovative project. He was successful in implanting the seeds of creativity in the young minds through motivational videos and living examples. The lecture was highly motivational and it received immense applause from the participants. The Department of Mechanical Engineering organized a one day workshop on “Engine Design” for the final year B.Tech students on 16th January 2018 in association with Regional Skill Development and Certification Authority (RSDCA), an autonomous body under the Govt. of India. The primary objective of the workshop was to impart the fundamental know-how on the design of an Internal Combustion (IC) engine. The workshop was inaugurated by Prof. Anil Kumar AV, Head, Department of Mechanical Engineering. The sessions were handled by Mr. Sandeep Sadanandhan, a leading technical trainer with RSDCA. His session started with an introduction to the various functional components of an IC engine followed by the analysis of an IC engine model. At last, he has demonstrated the working of a homemade 8cc IC engine. The classes were highly informative and received immense positive response from the students. The workshop witnessed 120 participants. 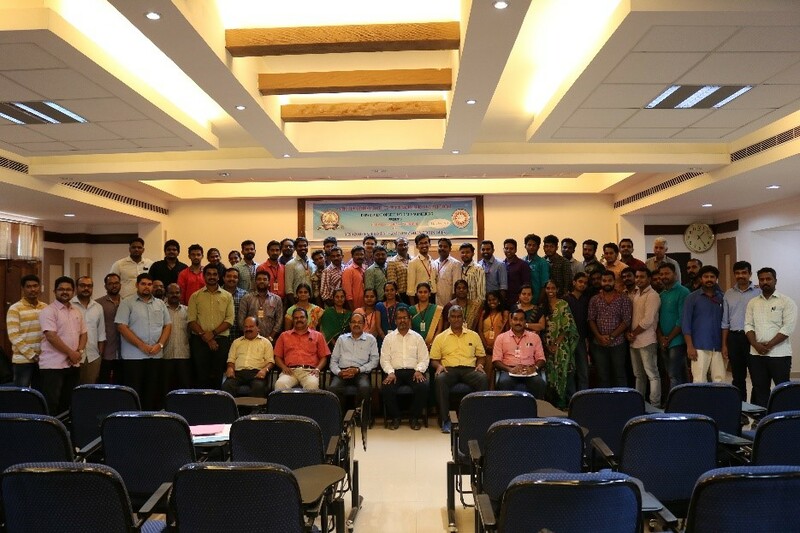 The department organized a National Conference entitled “Recent Advances in Mechanical Engineering (RAME 2018)”as a part of the Second Annual Series of the E2F2’18 Conference of the Sree Buddha College of Engineering, Pattoor on 17th April 2018. This was a platform for academics, industrial experts, researchers and students to present their projects and findings and involve in active discussion. The number of abstracts received was 34 and all abstracts were accepted for full paper submission. The number of full papers received is 30, out of which 26 full papers were accepted for the oral presentation and 4 papers were rejected. The number of papers registered for the conference is 26 (13 external + 13 internal) out of which 14 papers were presented on the day of the conference. 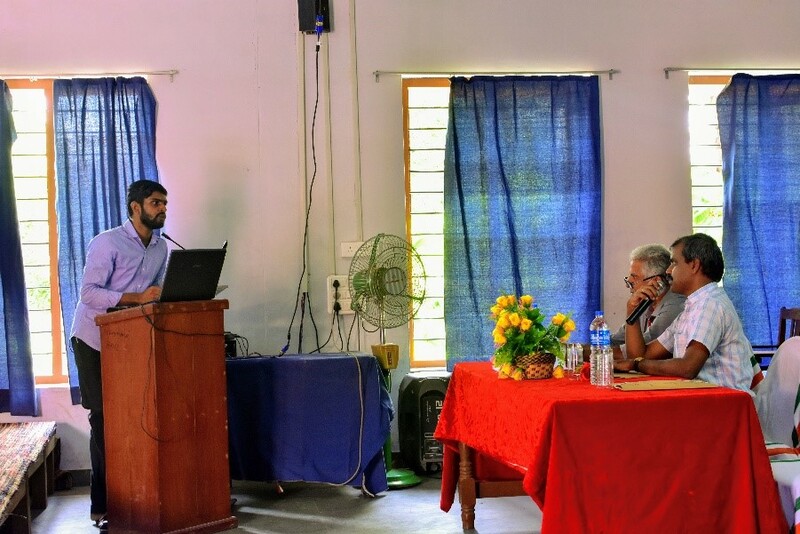 The conference was chaired by Dr. Jose Mathew, Associate Professor, Department of Mechanical Engineering, College of Engineering, Adoor and the rapporteur was Dr. Saji Varghese, Professor, Department of Mechanical Engineering, Sree Buddha College of Engineering, Pattoor. The conference started with an introduction and followed by a welcome address. The time allotted for each participant was 15 minutes. Two best papers were selected by the conference chair and they were presented with a memento and certificate. 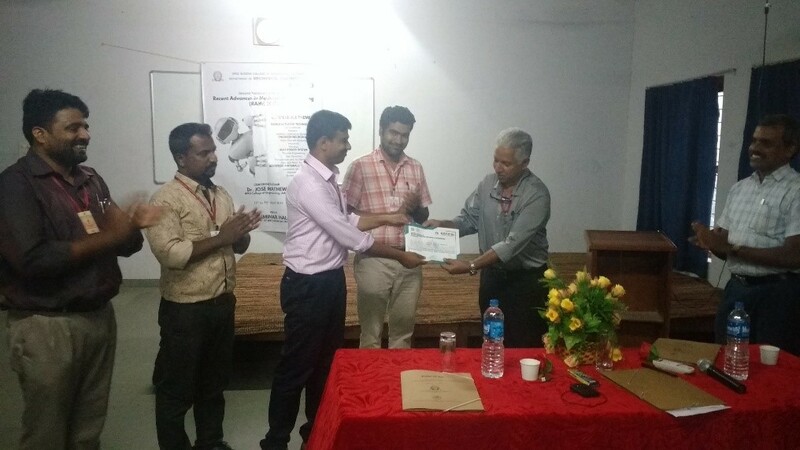 The best paper award was given to Dr. Trijo Tharayil, Associate Professor, Department of Mechanical Engineering, Sree Buddha College of Engineering, Pattoor and the second best paper award was given to Mr. Vineeth K, PG Scholar, Department of Mechanical Engineering, Sree Buddha College of Engineering, Pattoor. With a vision to train teachers of various professional institutes in effective use of Information and Communication Technologies (ICT) in education and in the online blended teaching-learning process, IIT Bombay has organized Faculty Development Program (FDP) approved by the All India Council for Technical Education (AICTE) at our college remote centre (RC ID 1302). Two separate FDPs each equivalent to two-week course, were conducted under the aegis of Pandit Madan Mohan Malviya National Mission for Teachers and Teaching (PMMMNMTT), MHRD, GoI. 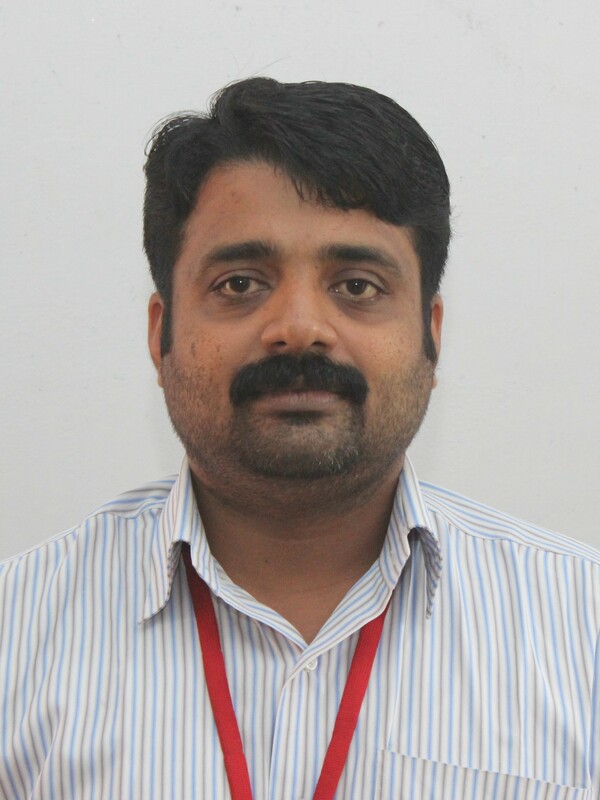 Dr. Sreejith Mohan, Associate Professor, Department of Mechanical Engineering coordinated the workshop. The first FDP series on “Foundation Program in ICT for Education” was offered from 3rd August 2017 to 7th September 2017. This course included two day face to face interactions between the course instructors and participants through AView at our college remote centre during 19th and 20th August 2017 which witnessed 23 participants from various engineering colleges within Kerala. Among them, 22 succesfully completed the course and got enrolled to the second FDP series. The second FDP series on “Pedagogy for Online and Blended Teaching-Learning Process” was scheduled from 14th September 2017 to 12th October 2017 which included face-face interactions during two weekends. The first face-face interaction of this FDP series was conducted during 16th and 17th September 2017 and the second interaction was held during 7th and 8th October 2017. 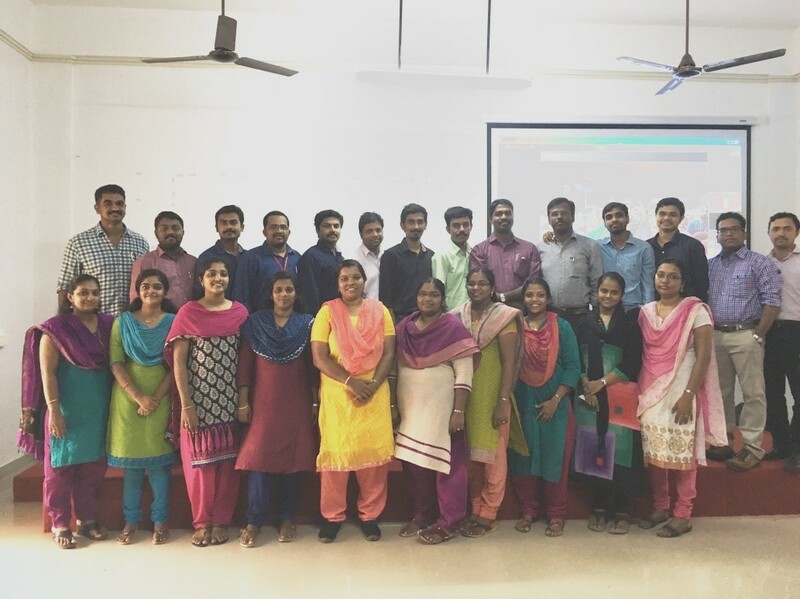 Department of Mechanical Engineering, Sree Buddha College of Engineering organized a Two Day Workshop on “3D Printing and Coordinate Measuring Machine” in association with QUOIN Mechanics, a startup company from Trivandrum. The Inaugural function was conducted at Seminar hall, Mechanical block. Prof. Anilkumar A V, HoD, gave the welcome note, Principal Dr. S. Suresh Babu gave the Presidential address and Shri K K Sivadasan, Treasurer, Sree Buddha Educational Society inaugurated the function by giving the Inaugural address. 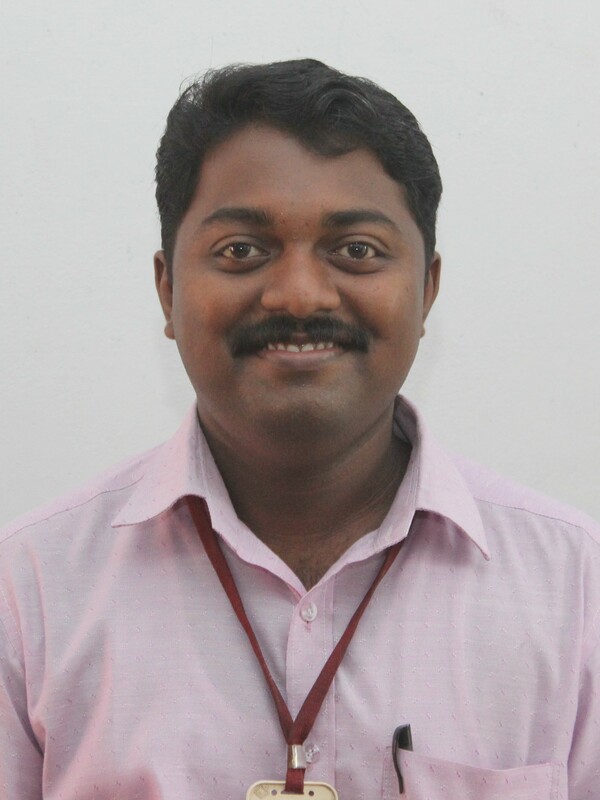 Dr. Saji Varghese, Professor felicitated the function and Vidya V, Assistant Professor gave the vote of thanks. The first day of the workshop consisted of lecture sections on “Coordinate Measuring Machine” handled by Vidya V and on “3 D Printing” by Vaisakh.Y, Assistant Professors, Department of Mechanical Engineering, Sree Buddha College of Engineering, Pattoor. The second day consisted of hands-on training on Mitutoyo Crysta Plus CMM, SD 300 Pro RPT Machine, Plycast Fused Deposition type 3D Printer which was handled by Niju Thomas, CEO, Quoin Mechanics. There were 43 participants, out of which 5 were from other Engineering Colleges. As part of the National Technology Day Celebration, Department of Mechanical Engineering has organized TECNICA 2K18, in association with Kerala State Council for Science, Technology and Environment (KSCSTE). The Theme for this year was ‘Science and Technology for a Sustainable future’. 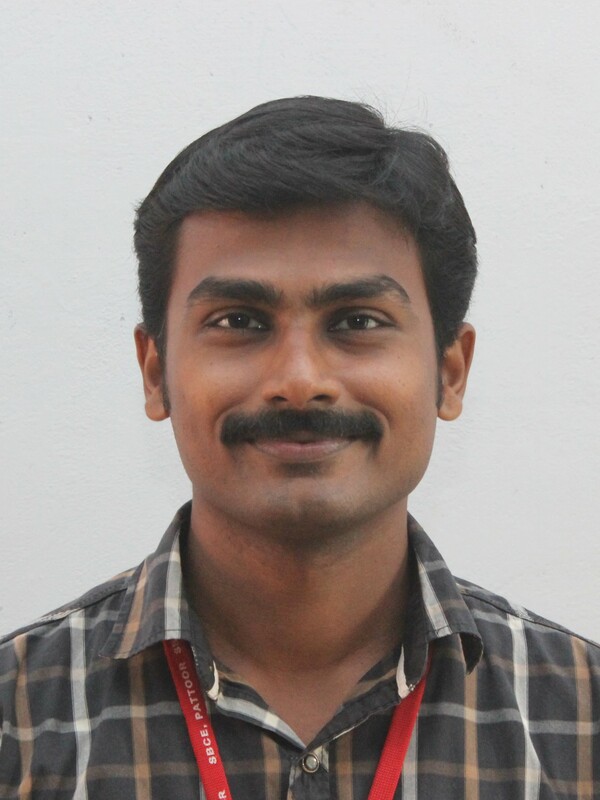 Mr. Amjith T R, NSS Program Officer welcomed the gathering. 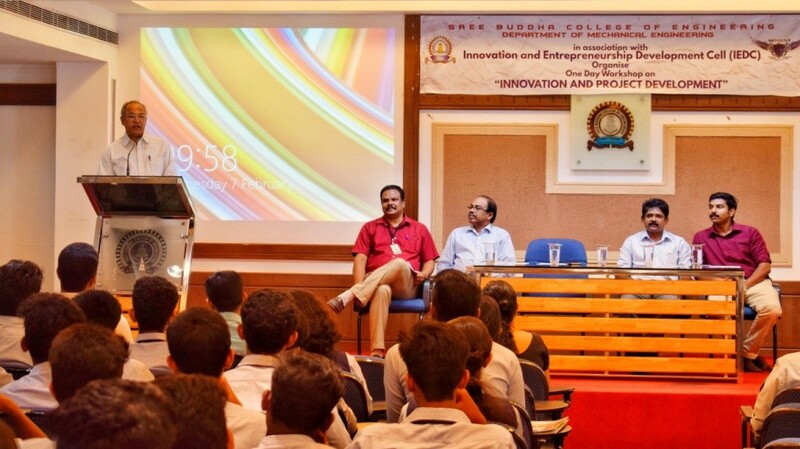 The function was presided over by Dr. S Suresh Babu, Principal, Sree Buddha College of Engineering, Pattoor. 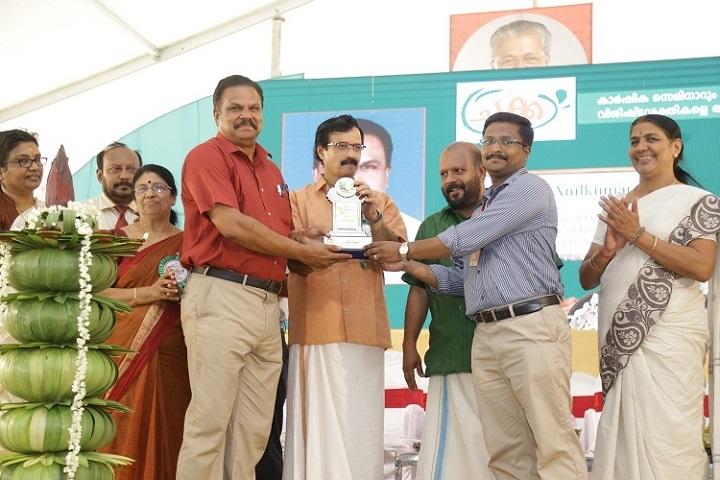 Chief Guest of the function Dr. Rag R L, St. Thomas College of Engineering, Thiruvanathapuram inaugurated the event and gave a technical talk on “Science and Technology for Sustainable Future”. Mr. K K Sivadasan, Treasurer, Sree Buddha Educational Society, felicitate the gathering. 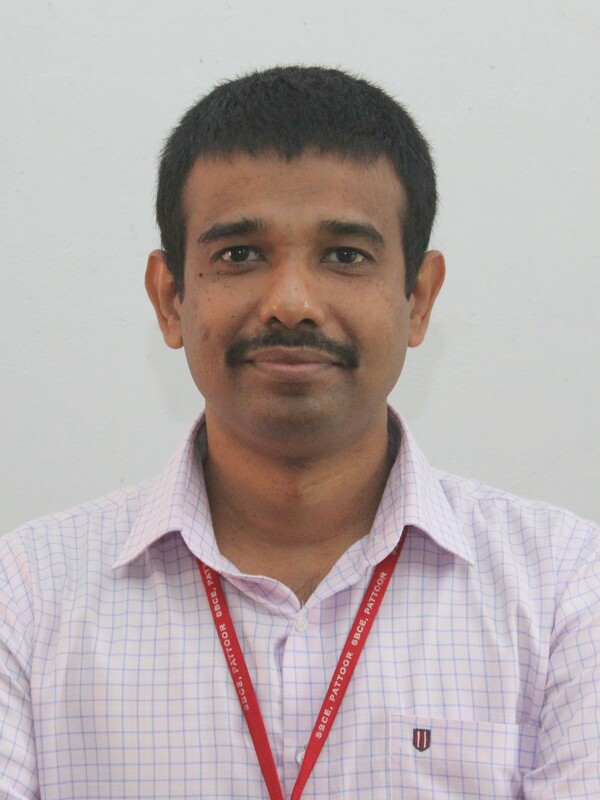 The Vote of Thanks was given by Mr. Vaisakh P S, Assistant Professor, and Department of Mechanical Engineering. A 5-day internship on ‘Computer – aided design & analysis’ in solidworks was organized by Department of Mechanical Engineering from 18 to 22 July, 2016 in association with INFOGRAFIX Technical Training & Solutions. The Program was inaugurated by Prof. Anilkumar A V, Head of Dept of ME. 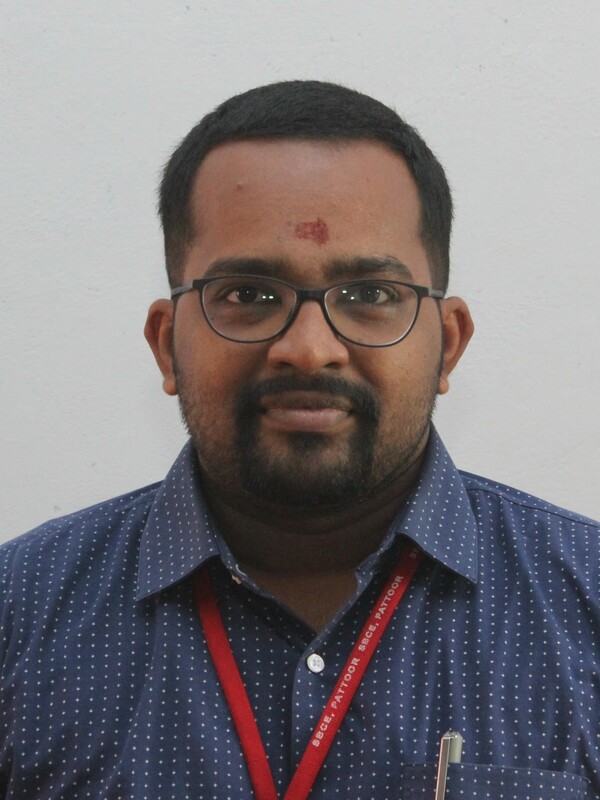 Mr Arun M, AP, ME was the coordinator of the Internship program and he addressed the first year KTU students and explained the importance of design and analysis software in mechanical field. Ms. Vidya V, AP, ME, Ms. Kaplana Ashokan, AP, ME were present in the inaugural function. The Department of Mechanical Engineering organized “PRAYUKTI” in connection with the National Science Day celebration sponsored by Kerala State Council for Science, Technology and Environment and supported by Department of science and Technology (Govt. of India) on February 28, 2017 based on the focal theme “Science & Technology for specially abled persons”. 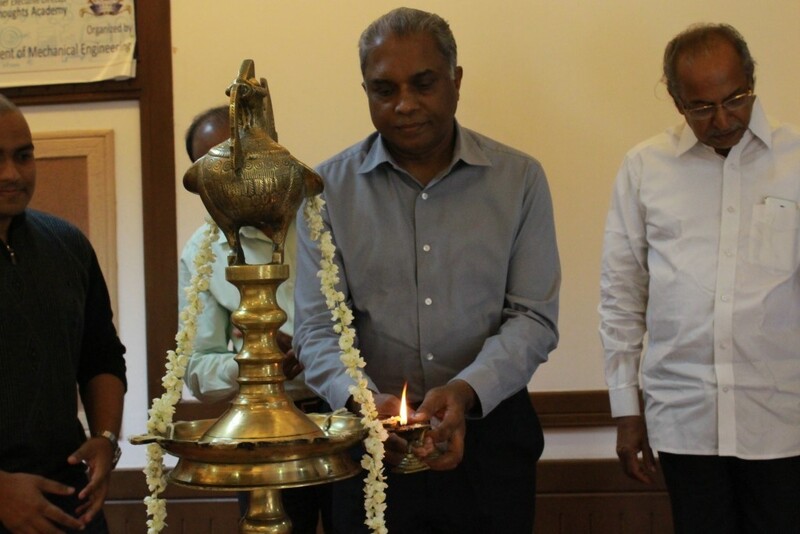 PRAYUKTI was inaugurated by Dr.Samuel N. Mathew, Executive director, National Institute for Speech & Hearing, Tvm. The Presidential address was delivered by Sri. K.K. Sivadasan, Treasurer, Sree Buddha Educational Society, Kollam followed by felicitation by Dr. S Suresh Babu, Principal, Sree Buddha College of Engineering, Pattoor and by Mr. Praveen Parameswar, CEO Thoughts Academy, Tvm, The event was well attended by 220 students and their accompanying teachers from nearby schools. As a part of Student Convention 2017 Tier -1 Competition were conducted by SAEINIDA Sree Buddha collegiate club in Association with Department of Mechanical Engineering. Out of 35 competitions proposed by SAEISS, 10 of them were conducted at SBCE. A few of the events are Welding, Taper turning, Work holding, Threading, Business plan completion, Technical paper presentation, Auto quiz, Material Identification, How things work. About 75 students of the collegiate club participated in various competitions. The competitions were properly judged and first, second and third positions were determined. The students who got first and second positions can participate in Tier -2 events, which will be a state level competition. 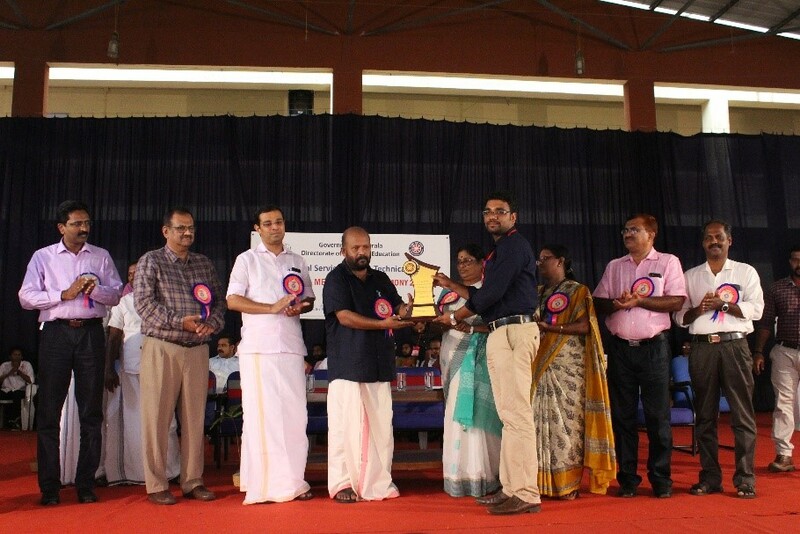 The competition was coordinated by Faculty Advisors Dr. Sreejith Mohan, Mr. Vaisakh.Y and Student representatives Mr. Christy Reenu, Mr. Harikrishnan M G, Mr. Jidhin S and Mr. Amar G of S8 ME. 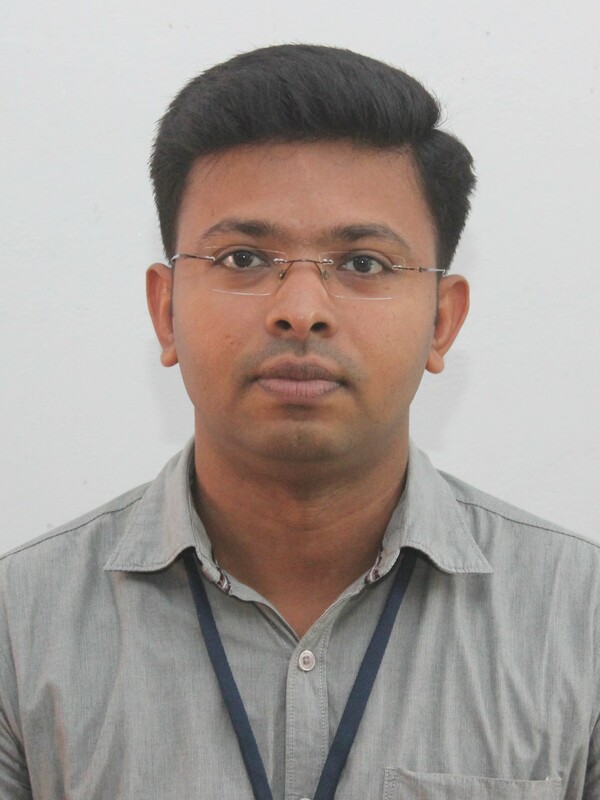 Sreejith Mohan, Control of exposure to Hexavalent chromium concentration in shielded metal arc welding fumes by nano-coating of electrodes, International journal of Occupational and Environmental Health, 2018 (DoI: 10.1080/10773525.2018.1436014. 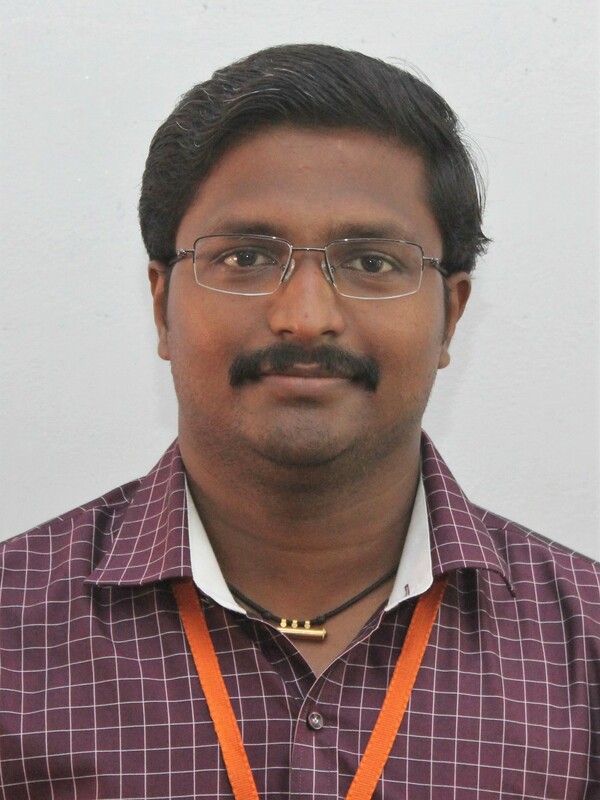 S. Senthil Saravanan, Mechanical behavior of carbon nanotubes reinforced AA 4032 bimodal alloys, Materials Today, Volume 5, Issue 2, Part 2, 2018, Pages 6717-6721. Kiran Sankar M.S, Design and Fabrication of hybrid aluminium composite for automobile connecting rod, Advanced Manufacturing and Materials Science, 2018 . B.Sajin, Finite element Analysis for deformation studies in natural fiber (Human hair) composites, International Journal of Applied Engineering Research (IJAER), ISSN 0973-4562 Volume 13, Number 9, 2018, pp. 6894-6897. B. Sajin , Finite Element Analysis for Deformation Studies in Natural Fiber (Human Hair) Composites, International Journal of Applied Engineering Research, ISSN 0973-4562 Volume 13, Number 9, 2018, pp. 6894-6897. J B.Sajin, Evaluation of emission, performance and combustion characteristics of dual fuelled research diesel engine, Environmental Technology, 2018, Print ISSN: 0959-3330 Online ISSN: 1479-487X. Trijo Tharayil, Effect of nanoparticle coating on the performance of a miniature loop heat pipe for electronics cooling applications. Journal of Heat Transfer 140 (2), 2017 022401-09. Sreejith Mohan, Corrosion Protection of AISI 304 Stainless Steel by Multi-Layered Nano ZrO2-TiO2 Composite Coatings, Global Nano Technological Congress and Expo, April 14-18, 2018, Dubai. Sreekumar E.N, National Conference on “Recent Advances in Mechanical Engineering” RAME2018. Sree Buddha College of Engineering, Alappuzha, Kerala, 17-18th April 2018. Vaisakh P S, Review on jack fruit dressing Machine, National Conference on “Recent Advances in Mechanical Engineering” RAME2018. Sree Buddha College of Engineering, Alappuzha, Kerala, 17-18th April 2018. Vidya V, Physeco chemical characterization of cross linked polyethylene in total knee replacement, National Conference on “Recent Advances in Mechanical Engineering” RAME2018. Sree Buddha College of Engineering, Alappuzha, Kerala, 17-18th April 2018. Vaisakh P.S, Domestic coconut oil extraction machine, National Conference on “Recent Advances in Mechanical Engineering” RAME2018. Sree Buddha College of Engineering, Alappuzha, Kerala, 17-18th April 2018. Sreejith Mohan, Investigation on the influence of Nano-structured Zirconia on the corrosion inhibition of SS 304 stainless steel, International conference on Advanced Manufacturing and Material Science, Muthoot Institute of Technology, 15-16 Jan. 2018. Sreejith Mohan, Corrosion protection of AISI 304 stainless steel by multilayer Nano ZrO2-TiO2 composite coatings, Kerala Technological Congress (KETCON), APJ Abdul Kalam Technological University and Kerala State Council for Science Technology and Environment, 23-25 Feb 2018. S. Senthil Saravanan, J.B.Sajin, Sreejith Mohan, Synthesis of metal catalyst carbon nanotubes by arc-discharge method used for energy efficient applications, International Conference on Sustainable Engineering & Technology (IConSET-2018), ACS College of Engineering, Bengaluru, April 2018. 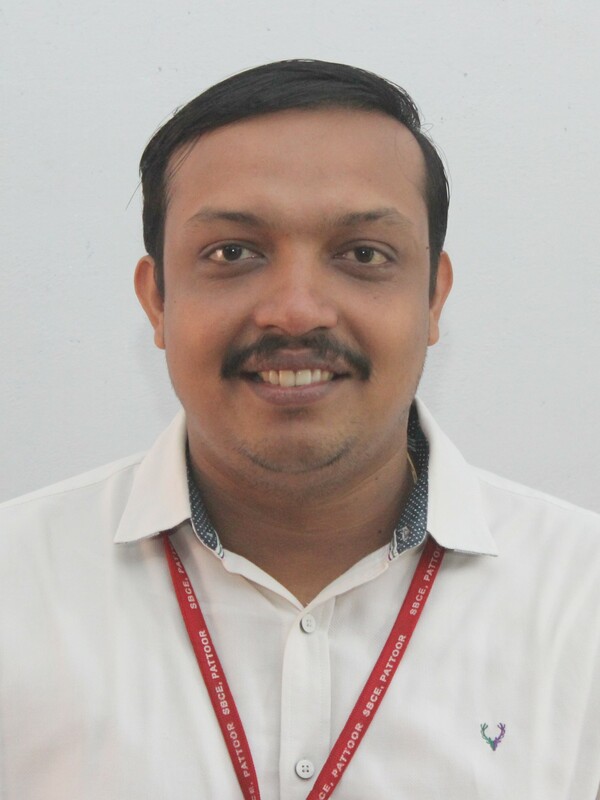 Kiran Sankar M.S, Design and Fabrication of hybrid aluminium composite for automobile connecting rod, International conference on Advanced Manufacturing and Material Science, Muthoot Institute of Technology, 15-16 Jan. 2018. 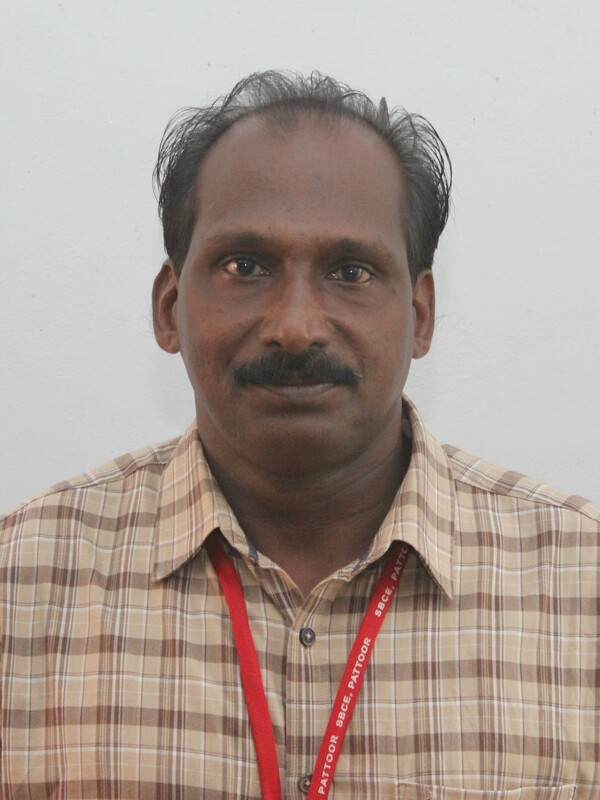 Sreekumar E.N, Study on Tribological and surface repairing performances of hybrid Nanolubricants on Al alloy, Kerala Technological Congress (KETCON), APJ Abdul Kalam Technological University and Kerala State Council for Science Technology and Environment, 23-25 Feb 2018. J B.Sajin, M.S.Senthil Saravanan, Sreejith Mohan, Synthesis and mechanical properties evaluation of nano alumina nano rice husk fiber reinforced polymer matrix composites, ICITEST2K-18, Rajas Engineering College, 23rd March 2018. 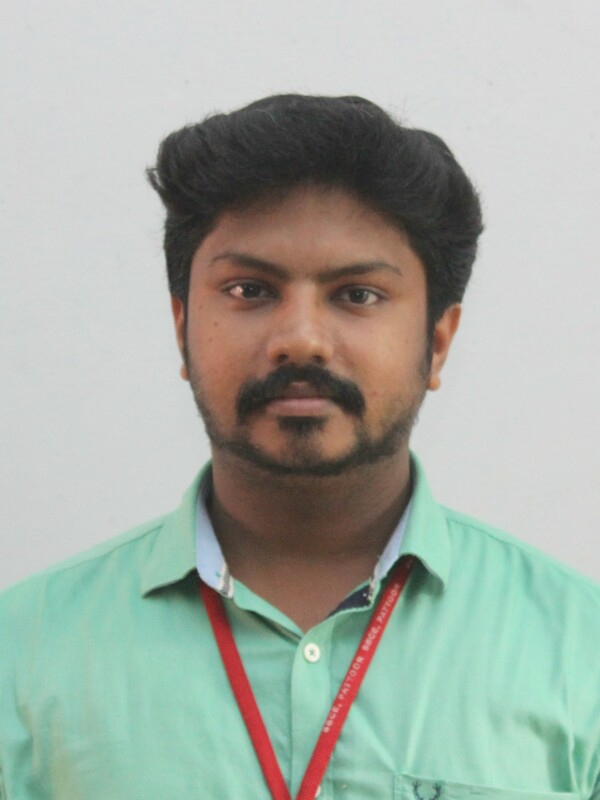 J B.Sajin, M.S.Senthil Saravanan, Sreejith Mohan, Vaisakh Y, Ratheesh R, Experimental Investigations on Mechanical Properties of Jute Mat Fiber Reinforced Composites with Polyester Resin Matrices, ICAIET-18, Rohini College of Engineering&Technology, 28th March 2018. J B. Sajin, Mechanisms of Thermal Decomposition of Jute Fiber Reinforced Composites, National Conference on Engineering Applications, Universal Engineering College, 16th March 2018. Sreejith Mohan, Influence of Nano Structured ZrO2-TiO2 Composite on the Corrosion Inhibition of AISI 304 Austenitic Stainless Steel, National Conference on Ecofriendly Technological Innovations for Sustainable Development, Sree Buddha College of Engineering, Pattoor, Alappuzha, 6-7 April, 2017. Trijo Tharayil, Renjith Raj R., Gokul O., Aswin Mohan, Thermal performance of a miniature loop heat pipe at different filling ratios using distilled water. National Conference on “Recent Advances in Mechanical Engineering” RAME2018. Sree Buddha College of Engineering, Alappuzha, Kerala, 17-18th April 2018. 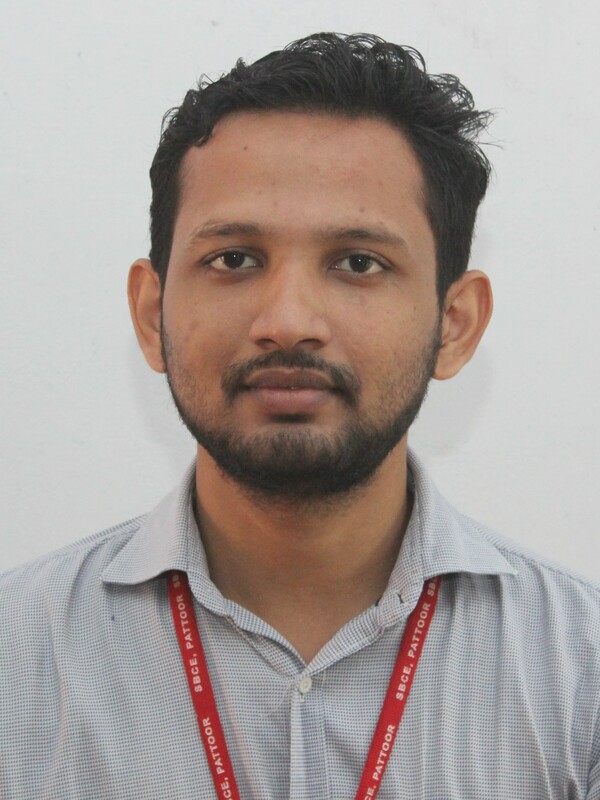 Trijo Tharayil, B. Sajin, Renjith Raj R., Gokul O., Aswin Mohan, Effect of graphene-water nanofluid on the thermal performance miniature loop heat pipe. National Conference on “Recent Advances in Mechanical Engineering” RAME2018. Sree Buddha College of Engineering, Alappuzha, Kerala, 17-18th April 2018. Trijo Tharayil, Heat Transfer Performance of Nano Coated Miniature Loop Heat Pipe with Graphene-Water Nanofluid. National Conference on “Innovations in Mechanical Engineering” NCIME ’17. 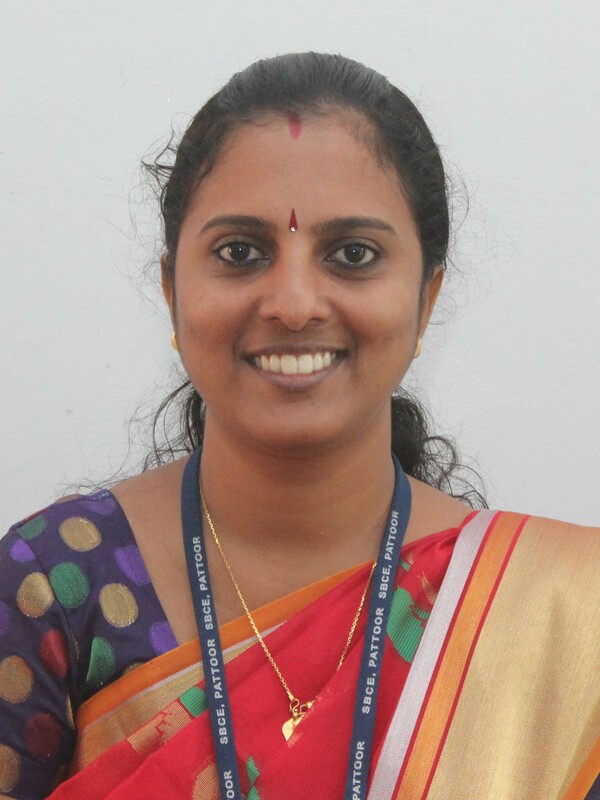 Karunya University, Coimbatore, 20th April 2017. 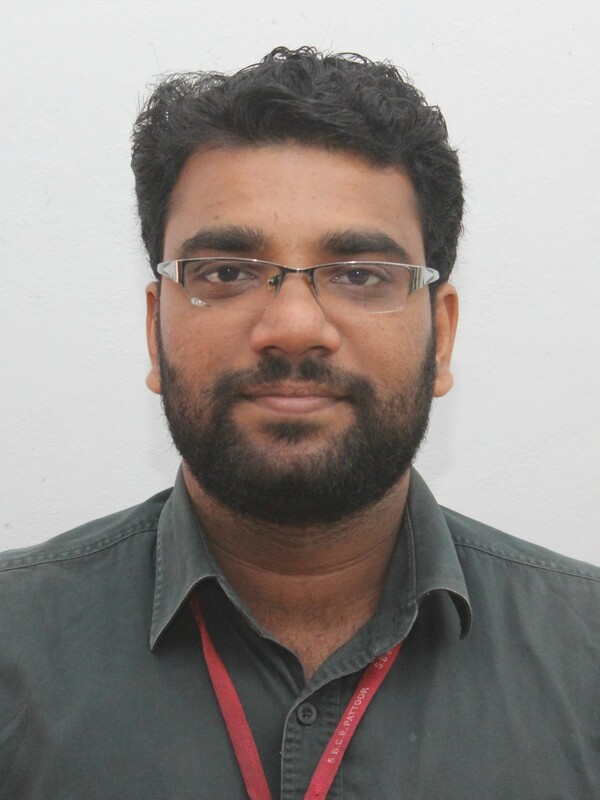 Trijo Tharayil, Effect of Nanoparticle Coating at Evaporator on the Thermal Performance of Miniature Loop Heat Pipe. National Conference on “Innovations in Mechanical Engineering” NCIME ’17, Karunya University, Coimbatore, 20th April 2017. Gokul .O, Effect of grapheme –water nanofluid on the thermal performance miniature loop heat pipe, National Conference on “Recent Advances in Mechanical Engineering” RAME2018. Sree Buddha College of Engineering, Alappuzha, Kerala, 17-18th April 2018. Gokul .O, Thermal performance of a miniature loop heat pipe at different filling ratio using distilled water, National Conference on “Recent Advances in Mechanical Engineering” RAME2018. Sree Buddha College of Engineering, Alappuzha, Kerala, 17-18th April 2018. Jinan .S, Nano structured Tio2 Coating for the corrosion inhibition of stainless steel, National Conference on “Recent Advances in Mechanical Engineering” RAME2018. Sree Buddha College of Engineering, Alappuzha, Kerala, 17-18th April 2018. Amjith T R, Design and development of wind powered and water purification system” RAME2018. Sree Buddha College of Engineering, Alappuzha, Kerala, 17-18th April 2018. Vijeesh, Corrosion behaviour of austempered ductile iron (ADI) in iron ore slurry. International journal of Engineering Science and Technology, Vol.8, No.3, 2016, pp. 7-12. Vijeesh, The effect of chilling & Ce Addition on the micro structure and mechanical properties of Al – 23Si Alloy, J. of Materials Engineering & Performance, Vol. 26 (1), 2016, pp. 343-349. 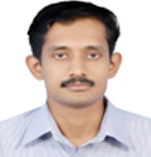 Sreejith Mohan, Modeling of Fume Formation from Shielded Metal Arc Welding Process, Metallurgical and Materials Transactions B, 48, 2017, 1268-1278. Vijeesh, The effect of Strontium modification on T6 heat treatment parameters, micro structure and hardness of Aluminium Silicon – A356 alloy, Journal of Material and Metallurgical Engineering, 2016. 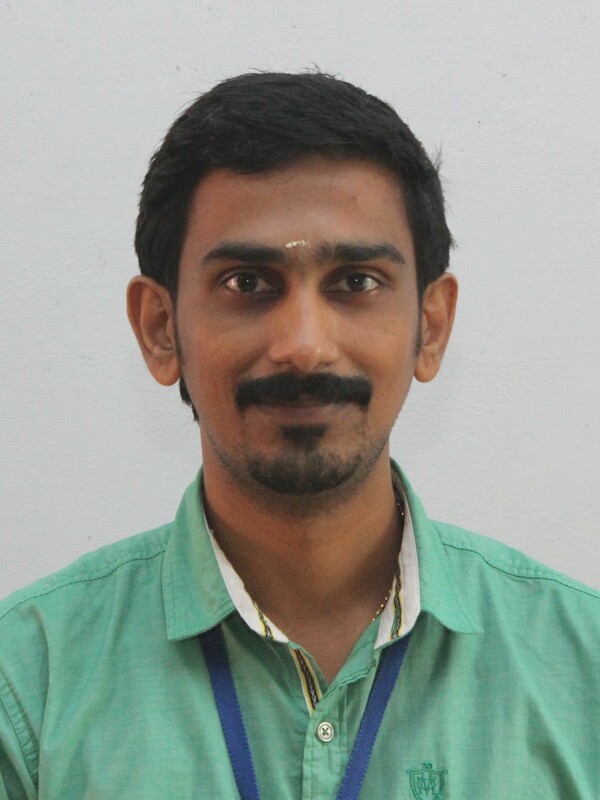 Amjith T.R, Forming Limit Diagram Generation of Aluminium Alloy AA2014 Using Nakazima Test Simulation TOOL, Procedia Technology, Vol 24, 2016, pp386-393. 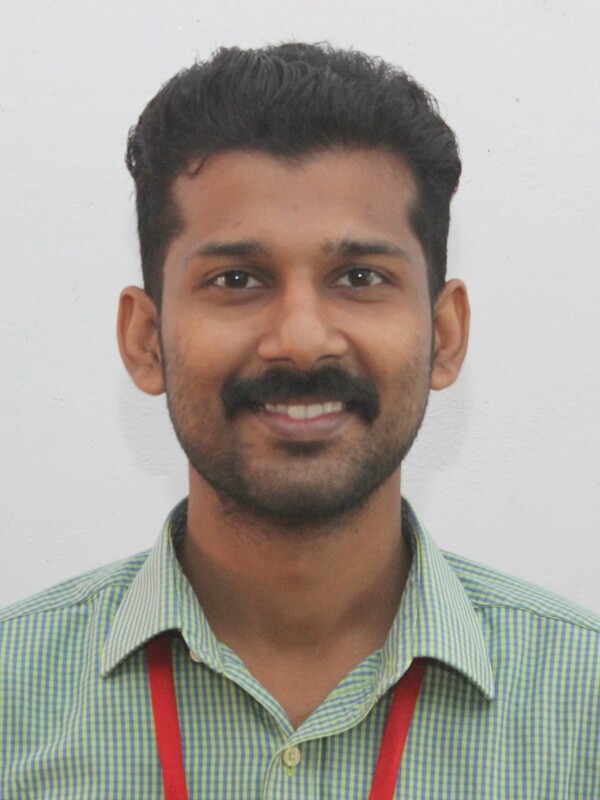 Vijeesh, Effect of strontium modification on T6 Heat treatment parameters, Micro structure & Hardness of Aluminium Silicon A356Alloy, Proceedings of national conference on futuristic advancements in ME (FAME-2K16), Aug 8-9, 2016, CAPE, Thalassery.